However, the arguments on three of the four main issues of the text, namely the existence of working class autonomy, the rejection of the Marxist labour theory of value, and Marxist crisis theory have not been seriously challenged. The more significant criticism has been over the need for political organisation or a political party and its formation which was the main thrust of the text. This criticism can be divided into two main categories. The first admits the need for a party for the overthrow of capitalism but argues that the party will arise from the workplace struggles on their own while the second argues that the party is no longer needed at all and that it is a relic of the past. We have dealt with the second view, with which we completely disagree, in other texts and do not intend to consider here. Our critics have pointed out that various sections of the movement did form political organisations contrary to the assertion in the text that the movement did not form a political organisation. The text’s statement was incorrect and should have been qualified to say that no single organisation was formed and those which were formed did not survive the 1970s. However, for us the key point, which was made in the text, was that the organisations which were formed did not break from the politics of the capitalist left and consequently could not give the movement a coherent anti-capitalist direction. LC called for voting for the PCI in regional elections in 1975 and together with AO joined an electoral coalition, Democrazia Proletaria, in 1976. Later both organisations called for voting for the PCI in national elections. The call for voting for the PCI in national elections was launched after the so-called “historic compromise” or democratic alliance of the PCI with the Christian Democrats in 1976. For us there can be no justification whatsoever of any support, however critical or qualified, for the PCI. This party, like the Italian Socialist Party (PSI), showed itself to be an arm of the bourgeois class from the 1930s. This has been illustrated time and again, not least in the period spanned by the Autonomist movement. The Autonomists were opposed consistently by the PCI often with open violence. 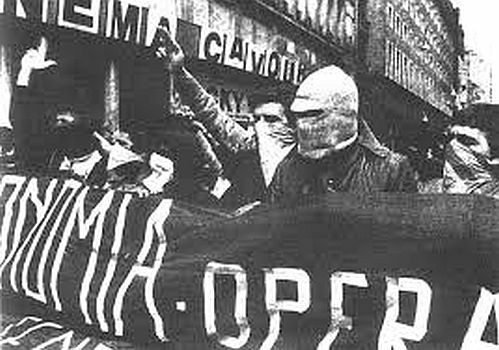 Autonomist militants were expelled from the PCI dominated union CGIL and from the party itself. Some were beaten up. An example of this was when PCI thugs beat up a workers’ committee at the Innocenti factory near Milan for organising a strike against redundancies in October 1976. The PCI compiled lists of Autonomist “trouble makers” and handed them to the bosses leading to militants being made redundant. Later, during the period when the Red Brigades’ assassination of Aldo Moro provided the pretext for the full force of the state to be brought down on the Autonomist movement, the PCI handed their lists to the prosecuting judge, Calogero. Judge Calogero, himself a PCI member, issued arrest warrants for many Autonomist militants in April 1979. This resulted in many comrades spending years in prison on completely false charges. Rejected the lie of national roads to socialism. The PCI now announced there was a parliamentary route to socialism. For this the PCI slandered the PCInt comrades branding them as agents of the Gestapo and launched a manhunt against them. In 1945 two PCint comrades were murdered by PCI assassins and other comrades “disappeared” all on the orders of PCI leaders. Meanwhile fascists were freed from prison and granted amnesty on the orders of the new Minister of Justice, who just happened to be the leader of the PCI, Togliatti. Autonomist struggles were conducted by works committees that operated outside the official trade unions and independent of the CPI and PSI. Where there were many factories or branches of an industry in an area works committees were federated and in some regions, e.g. Porto Marghera, an Autonomous assembly was formed. The purpose of this assembly was to coordinate workers struggles both inside and outside the factories. The assemblies became points of reference for other social struggles. In many areas assemblies were supported by students. In Turin, for example, there was a worker/student assembly grouping 1500 workers. Such organisation generated a tremendous social energy and solidarity with the potential to grow into a massive social movement. The “Hot Autumn” of 1969 and the years which followed in the early 70s saw a section of the Italian working class, especially those in the large factories, escape the control of the trade unions and the PCI and PSI. They carried out class resistance to capitalism on a greater scale than anything Europe has experienced in the period since the Second World War. However, workers in the smaller factories and industries remained under the control of CGIL and PCI and in the country as a whole these organisations retained control of a major section of the working class. Despite the successful organisational forms adopted, almost all the material gains or the earlier period were taken back by the capitalist class in the 1980s. Autonomist militants meanwhile rotted in gaol and the trade unions reasserted their hold in the factories. A response to the crushing of the movement was the creation of new unions or base unions, COBAS. This was a step backwards organisationally since as the new unions became recognised by the bosses they officially functioned as negotiators of the price of labour power. This soon placed them in the same situation as the official existing unions. However, when the US entered the war, the IWW regarded the war as simply an interruption to building the organisation. It gave no political direction to its sections and left it up to each section to decide its attitude to the war. One of the most militant sections at the Philadelphia docks, which had carried out a massive and successful strike in 1913 saw hundreds of its members sign up for the military, and agreed a no-strike pact at the port for the duration of the war. This is another illustration of the need for a clear political organisation which is able to give a political lead in times of crisis. It also shows the failure of attempts to give the economic struggle precedence over the political struggle. “Our strength comes from our capacity for common collective action. And the proletarian revolution cannot come about through a mere chasing of immediate interests. The proletarian revolution has to be a conscious revolution. Under capitalist conditions though, some workers will come to recognise the need to overthrow the system before others. It is only natural that this minority form a political organisation to express their conscious aim of creating a new society”. 3 Potere Operaia collapsed in 1973, Lotta Continua in 1976 and Avanguardia Operaia in 1978. 5 This coalition included a spin off from the Italian Socialist Party (PSIUP) and a Maoist group. 6 Confederazione Generale Italiana del Lavoro. The largest Italian trade union. 8 G. Sbrogio, a militant from Porto Marghera autonomous assembly spent 4 years and 8 months in gaol accused of being the brains behind the Red Brigades. This is just one example of many workers who were falsely imprisoned by the state. Their real “crime” was fighting for working class interests and so threatening capitalist exploitation. 13 This is the assessment of PCInt. 14 This is articulated by Emanuela Furlanetto who participated in the self-imposed food price reductions. See the video “The Suspended Years” available from Mouvement Communiste. For more on Gramsci see leftcom.org . We will be publishing a translation of Onorato Damen’s Gramsci: Between Marxism and Idealism later this year. 15 COBAS acronym for Comitati di Base, or rank and file unions. 17 The Angry Workers of the World (AWW) and Mouvement Communiste support this position. 19 AAUD-E was the General Workers Union – unitary organisation. 22 This did not, of course, prevent the bourgeoisie from attacking the organisation, smashing its offices and imprisoning its leaders for terms of sometimes 10 to 20 years. IWW members were branded as first as spies of the Kaiser and later after October 1917 spies for the Bolsheviks!